Today I'm playing along with the " My Favorite Things Wednesday Sketch Challenge"
I used the paper from the 6x6 paper pad by My Minds Eye called "Be Happy"
the bears bow and the girls pants were paper pieced, the coloring was done with Prismacolor pencils blended with Gamsol.... the card really does look better than the picture..really! :) of course if I were to do it again, I'd probably paper piece the bear too! I had fun making it...so I guess that's what counts! 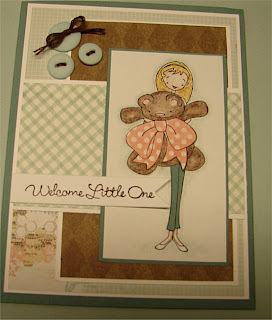 This is darling, I love that big polka dot bow! Hi Doni! I am popping in from the SCS comment thread. Great card! 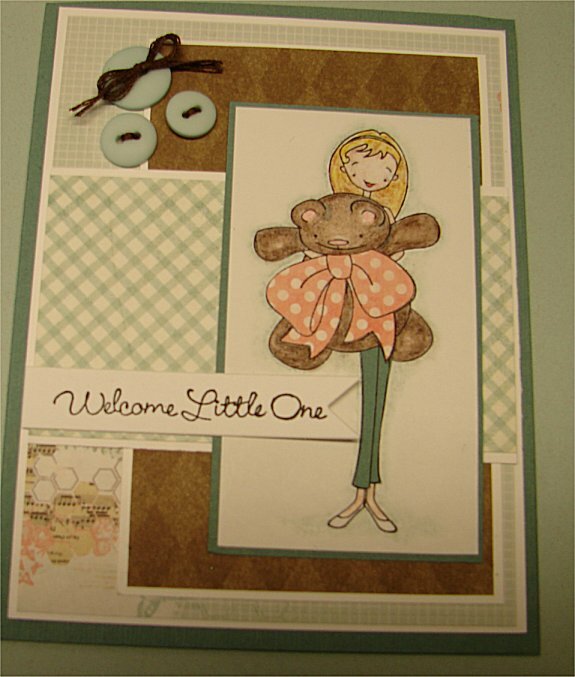 I love the soft colors and the paper piecing. One of my favorite techniques! So lovely! Great work,I love the image.